Britain is in the swing of a general election (8 June 2017) billed by some as a revolution, not only because of the contestants’ clashes over ideologically charged prescriptions to the country’s current ills but also due to a looming crisis with the European Union. 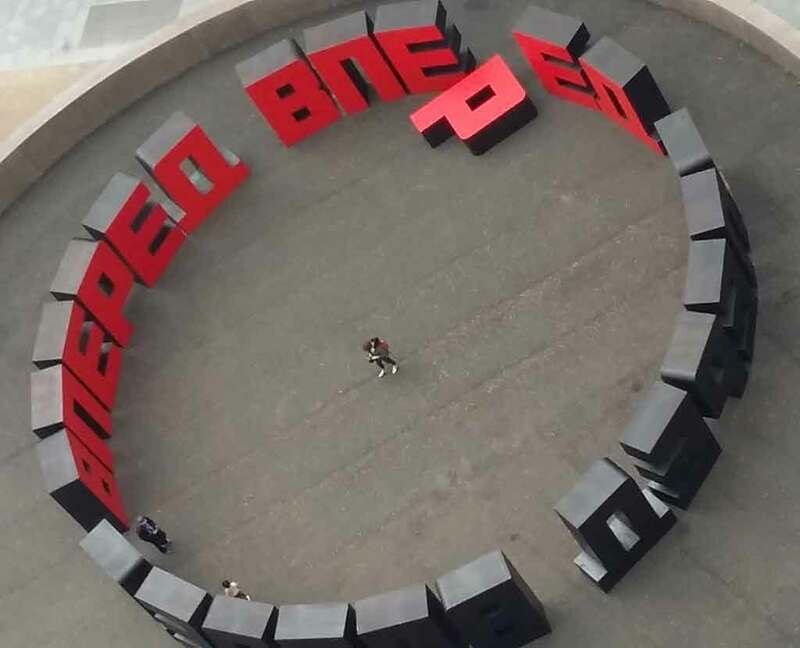 In comes Tate with its timed intervention, albeit coincidental, with the installation of Erik Bulatov’s monumental satirical steel sculpture Forward (Russian: вперед, vpered) to mark the centenary of the 1917 revolution which ended the monarchy and led to the creation of the Union of Soviet Socialist Republics (the USSR). Bulatov, who rose from street / underground art to gain mainstream recognition, appears to have thought of his creation after visiting a disused French iron foundry in Maubourguet, southwest France, and what he saw as its utter lack of power despite its mammoth size. Bulatov delivers his bite and his art’s contemporary—indeed everlasting—resonance in the way his modern construction of giant ((2900 x 18200 x 900 mm overall) Cyrillic letters making up ‘forward’ (вперед, vpered) four times, comes across in an almost venerable, worship-worthy circle reminiscent of Stonehenge, albeit checked or distracted by the textual message. Forward it ain’t, as it’s not going anywhere. A toppled-over letter р (r) from the assembly of letters delivers the coup de gâce. By Bulatov’s own and curators’ accounts, the artist was struck by the enormous, semi-derelict 19th century space and its lost potency and relevance, its structure reduced to representing a contemporary society, a demise and degeneration that few of its original architects, designers, builders or visionaries would have foreseen. Bulatov’s work resonates with witnesses to the eventual collapse of the USSR in 1991 and the ensuing litter of abandoned industries across the vast expanse of its successor state, the present Russian Federation. In that sense the art also brings to mind Britain’s own recent experience with one half of its population deciding to leave Europe in a miasma of deceit and clever wordplay at the highest political level, only to be reminded soon after of the many disillusions and disappointments in its wake in an ever-lengthening procession, its progress and final destination unknown. While Bulatov’s work, its bold forms and bright colours create a feeling of energy and movement, a Tate curatorial comment reminds us, their placement in a closed loop implies that progress may never really be possible. Forward will remain on display outside Tate Modern through the summer, and will be followed by two major Russian art exhibitions at Tate Modern in the autumn: Ilya and Emilia Kabakov from 18 October and Red Star Over Russia from 8 November. ©Sajid Rizvi. Additional Notes: Forward is Erik Bulatov’s first sculpture. 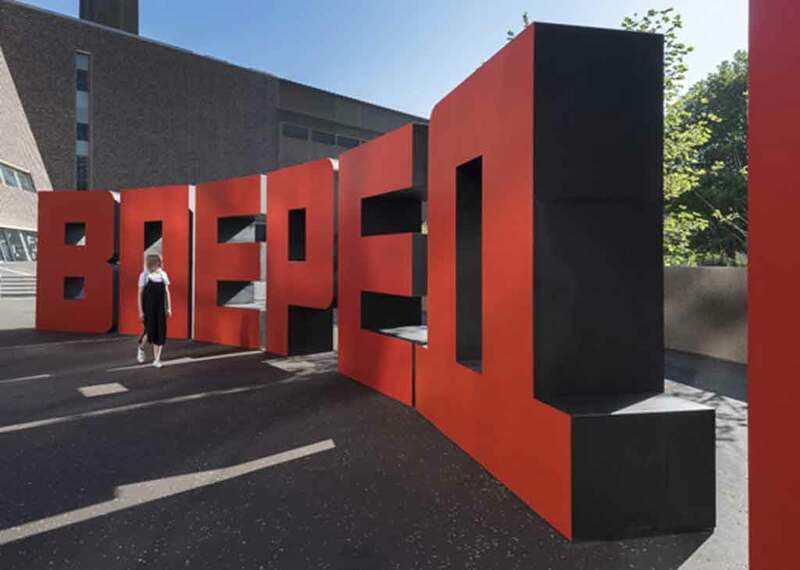 Encapsulating the aspirations of his generation and the disillusionment that followed, the artist conceived the work as the word ‘forward’ in its bold form and bright USSR-red façade against black surfaces in the rest of the body of the work. Bulatov was born in Russia in 1933 and began his career in Moscow in the 1960s, where he became a leading underground artist, before moving to Paris in the early 1990s. He is best known for paintings that explore the politically charged language of the Soviet and post-Soviet era. Forward 2016 was executed and installed with support from a/political, an arts organisation dedicated to the support and promotion of artists working within a socio-political framework. It was first shown at The Foundry, the very space that inspired the work. It was curated by Natalia Sidlina, Adjunct Research Curator, Russian Art, Supported by the V-A-C Foundation, Tate Modern, and project managed by Magdalena Maculewicz. The south terrace, where the work is on display, is a public space created as part of the new Tate Modern, and will regularly showcase work by artists and bring the gallery’s programme out into the city. Can a Macron effect save UK from Brexit?